Save your garden potatoes in a smaller space! Here’s how you can make your own dehydrated potato flakes from scratch! Buying boxed potato flakes for quick and easy mashed potatoes may seem like a great idea most of the time, right? There are some weird ingredients in the most popular brands that I want to avoid, and I like giving my family wholesome foods. Of course, you can easily store potatoes in a root cellar to last all winter long. So why would I bother making homemade potato flakes? There are several reasons. First, just because I can! I grow potatoes in my garden, and this is an alternative way to preserve the harvest. I often pressure can my potatoes for long-term storage, since I don’t have a root cellar, but I want another way to store them without taking up so much room. Have you tried putting a 50-pound sack of potatoes in a bug out bag? That same amount can fit into a 1/2 gallon sized mason jar, or a gallon sized Ziploc bag with room to push out the air and save space and weight. If I had to bug out, I certainly wouldn’t want to lug a huge sack of ‘taters with me. Dehydrating your own potato flakes isn’t hard at all. It just requires a bit of time and effort up front to get going. You start by washing and peeling your potatoes. You could leave the skins on, but the end result may be on the bitter side. Once you have the potatoes peeled, bring to a boil in a large pot with enough water to cover. Cook until the potatoes are done, with a fork or knife going thru them easily. You want them a bit on the mushier side. Once the potatoes finish cooking, DO NOT DRAIN. You want to use the cooking water to mash them. This stage isn’t the time to season or use milk or butter. That will come when you cook and rehydrate the flakes. Put the cooked potatoes in a mixing bowl and whip with only the cooking water until smooth. I used my kitchen aid for this, but you could do it with a hand mixer or even masher if you wanted. You want it as smooth as possible. 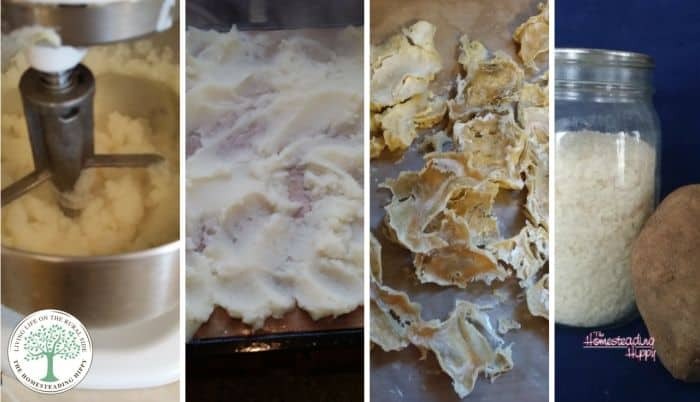 Lay the mashed potatoes out on a dehydrator sheet. I used the Excalibur dehydrator and the sheets for this. You will want to dehydrate the potatoes at 140° for about 24-36 hours, depending on how thick you put the potatoes on. I made them thicker than I should have the first time, and some turned black on me. They tasted the same, but it was a weird color and a bit off-putting for my family. You’ll know they are finished when they “break” instead of “bend” and they are a whitish golden color. Remove the dried pieces from the dehydrator and place them in either a blender or food processor to break up into flakes. Store in an airtight container. I use my dehydrated potatoes up each year, but if there is no water in them, the shelf life could be at least a couple of years stored airtight. Bring 2/3 cup water and 1 Tablespoon butter to a boil. Turn off the heat and add 1/4 cup milk and stir in 2/3 cup flakes. Add more butter or milk to taste, as this recipe will make potatoes that are on the “stiffer” side. Oh this is great to have on hand – thank you! I have seen oven canning for items like popcorn and rice. Have you tried this method with your potatoes? I’m curious to see what the shelf life would be. I haven’t ever oven canned…I usually just use the food saver vacuum sealer. But, I will try it and see if I can update the post with that info! How many cups of water and how many potatoes to use ? Without draining water. Thank you. 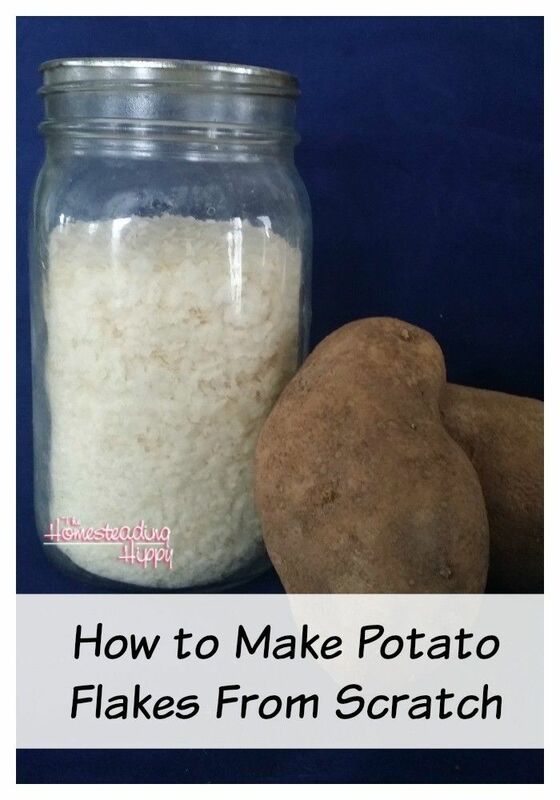 Use as many potatoes as you want, and have enough water to cover them while cooking. You just want to have the cooking water to mash them up with. Wonder if I could do this with cauliflower for a low carb “fauxtatoe” experience? Thoughts? oh, that’s an interesting idea! I may have to grab some cauliflower today! I am assuming that is for one serving?? yes, that is one serving size. I have been given a LOAD of potatoes so this is perfect timing. Can you mix the kinds of potatoes? Like red, yellow and russet together? I honestly don’t see why you couldn’t do that. I bet that would give it a lot more flavor in the end as well! This would be great in the fall when we can get potatoes very cheap. It has gotten lately where I haven’t wanted to buy so much because they spoil. I could do this and have them for quite a while! Love this thanks for the how to. This is so fantastic! I’m sharing this and can’t wait to try it out! Would this also work in an oven at a bit higher heat (170)? 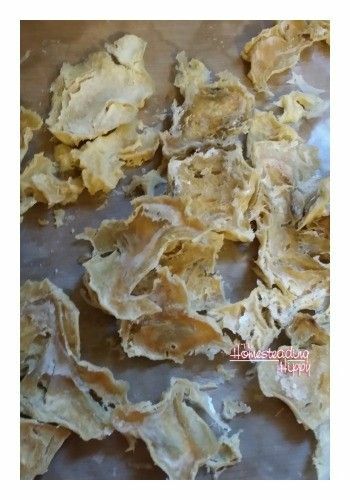 I know sometimes these recipes can be tweaked, and as I don’t have a dehydrator, wonder if I could still take advantage of this method. It’s very possible, and I’d say worth a shot! Also if u have a convection oven it may work faster because it works with a fan moving air. Hi Margem! Thanks for coming by! I am glad you enjoyed this idea…let me know how it works for you! If you don’t want to sit there peeling potatoes… after boiling them, place them in a bowl of ice water for a few seconds. Then, just grab it with both hands, twist, and pull apart. The skin should slide right off. (some people suggest scoring the middle before boiling) I just found this trick a few days ago and now seeing your idea I think it is time to test it out!!! What a great idea. I never would have thought flakes would be so easy to do! Thanks for this post! that’s a great idea! I’m going to try that trick! Great trick! I’m definitely one who doesn’t enjoy peeling! I had a 5 lb bag of potatoes that I had let sit to long, so I decided to try this. Peeled the potatoes and cooked them whole. Once done I mixed 1/2 T citric acid with a little cold water then added it as I mashed them ( to help keep the color). Had 4 dehydrator trays and one cookie sheet for the oven. In the oven I dried them at 170 degrees for about 5 hours with the door propped open., I flipped them about 1/2 way through. Then ran them through the blender, and put them back on the tray for about 1/2 hour, just to be sure they were dry. They turned out great rehydrated well. For 5 lbs of potatoes, I got 11 oz dry. Which works out to 2.2 oz dry = 1lb. So 1/4 cup of flakes will rehydrate to about 1 lb of mashed potatoes. If you are making up packages for camping you can add powdered butter and powdered milk, just increase your water to cover the fact you aren’t adding reg. milk. Do you think that you could do this effectively with pumpkin or squash? I don’t enjoy pressure canning pumpkin puree, and would love to have home grown ingredients for pumpkin pies/breads all year long. I have never tried that…worth a shot, though! You may want to consider freezing the puree, too. From all I read, pumkin and squash should always be canned in chunks or cubes. Due the heat not permeateting through, make it unsafe to can puried foods. I could be wrong. that’s what my understanding is, too. I really want these, tried it last year. Coincidentally following this exact procedure. When rehydrating they were like paste! I’m assuming it’s a starch issue, do you know what I might have done wrong? Ever had that problem? I had to use more water with some rehydrated batches…not really sure why, to be honest. Perhaps the starch stayed in longer when drying? In my opinion, the potatoes were over mixed through using either a hand mixer or a kitchenaid. Overworking potatoes results in overdeveloped starches and a gluey consistency, this is true even if you dehydrate it and then reconstitute it. The best thing to do is mash the drained potatoes normally using a masher until they are fluffy but not overworked, then dehydrate. There is no need to include so much water, since it’s just added work for your dehydrator. 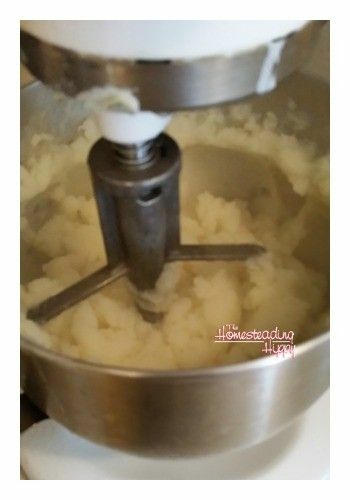 After the potatoes are dry, it’s easy to bust them up with a food processor anyway, which eliminates any lumps which may have been left by processing. I tried this with sweet potatoes. They came out excellent. that’s great to know!!! I’ll have to try it with sweet potatoes next! Interesting idea!! I would not have thought to cook the potatoes before dehydrating them. Hmmmm. Have you tried drying raw potato slices? Maybe using a mandoline slicer on a really fine setting? I’m just curious. Would love to hear if anyone has tried this. I tried that, but since they were not blanced, they turned an ugly black color. it didn’t affect the taste, but my family wouldnt eat them. Oh my YES!! I use my mandoline to slice the potatoes ( I leave the skins on) and then blanch till you can “see” through them but dont make them into mush. Rinse in COLD water and place on dehydrator as per instructions. They turn out GREAT!!!! It’s awesome, isn’t it? Great way to store and use them all year long! 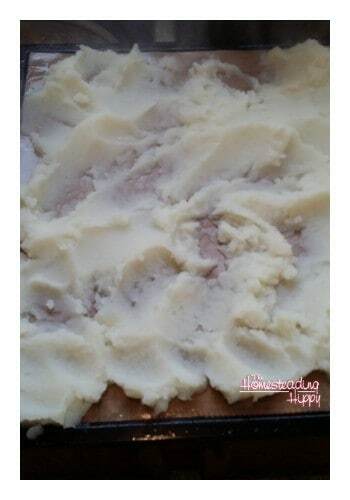 Have u ever try baking your potatoes first then add enough hot water so it will mash up to look like mash potatoes? I have never tried baking them…that’s an interesting thought. Maybe I’ll try that to see what’s up with it! Hi, I tried making these and they would not rehydrate properly. I was so disapointed cause I thought this would be such a great idea. There were parts of the potatoes that just never softened up. I could try cooking them longer but then they wouldn’t be “instant” potatoes. Anyone else have that problem? I honestly can’ say for sure why…ours have never had an issue. Maybe not enough liquid? Thank you, Darlene! I just had a bag of these kind of potatoes from Sam’s Club and didn’t understand this concept. I’ve NEVER gotten bad produce from there, but no matter how long I baked or boiled those potatoes, they never softened. Finally made hash browns out of them all (to freeze) and they’re ok. This will be perfect for the gluten ‘steaks’ and mashed potatoes meal I’m planning for our next camping trip!